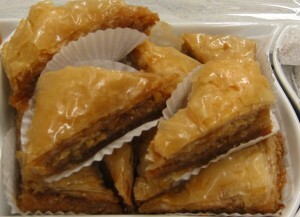 Baklava: Probably the best known Greek pastry. 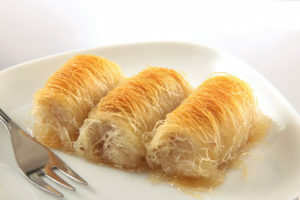 Layers of filo are brushed with butter and layered with a sugary spiced nut mixture ad soaked in a fragrant syrup laced with lemon and cinnamon. Chocolate Baklava: A Greek favorite with a twist! Kataifi: Nuts sandwiched between layers of shredded wheat like pastry and glazed with honey syrup. This Mediterranean delicacy is perfect with coffee, tea, or milk or a scrumptious delight. Koulourakia: This is the traditional Greek butter cookie flavored with a hint of vanilla and egg glazed. This cookie is very addictive and well known for its ring and twisted shape. A favorite of young and old. Kourambiedes: Also known as the Greek Wedding Cookie, this crescent-shaped butter cookie melts in your mouth. Covered with powdered sugar and filled with crunchy pieces of almond with a touch of brandy, gin, and vanilla. This cookie makes a great compliment to your favorite coffees and teas. Melomakarona: A vegan-friendly delight. This delicious spice cookie is soaked in a honey-based syrup made with vegetable oil, oranges, sugar, cinnamon, cloves, and nutmeg chocked full of walnuts. Pecan Queens Baklava: Pecans and walnuts nestled beside in flaky crispy layers of filo swathed in orange blossom honey syrup. As beautiful to look at as it is beautiful to eat. 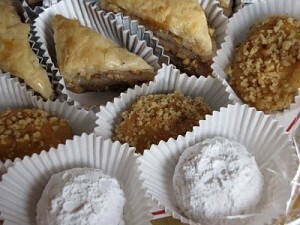 Almond Crescents: Sweet almond cookies Greek style. Galaktoboureko: A Greek dessert of semolina custard in filo. Made in a pan, it has filo layered on top and underneath and cut into square portions. It is served or coated with a clear, sweet syrup. 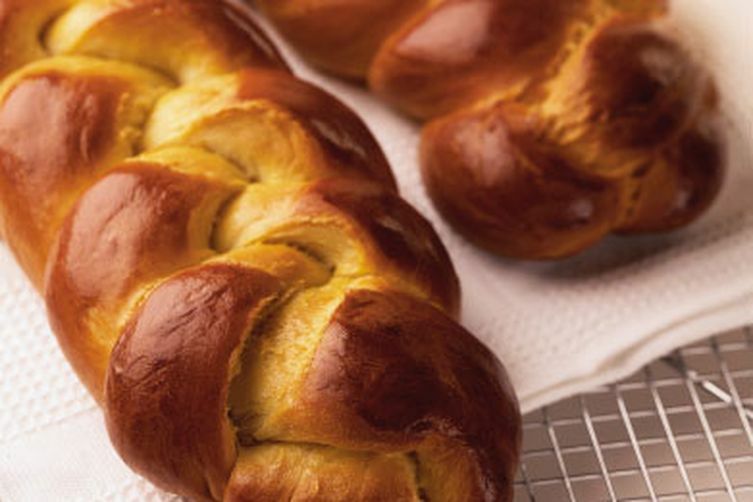 Tsoureki: Sometimes called “Easter Greek Bread” it is a sweet, egg-enriched bread, formed of braided strands of dough.